Horseback riding Bahamas is one of the top things to do in the Bahamas and is loved by almost any tourist. Whether it’s a relaxing sunset ride with a colorful orange glow fading on the Caribbean Sea or the wind in your hair as the horse’s race overland, everyone can find a pleasureful ride of their own. There’s no better way to see an entire Bahamas island than on the back of such beautiful animals. Even if you’ve been horseback riding before, you’ve never done it quite like this! Those looking for a romantic or adventurous experience, the scenes and thrill will fill those needs and much more. Let these creatures gallop their way into your itinerary while giving you an experience that will last a lifetime. Are you vacationing in Florida? That’s wonderful. We have an entire itinerary for those in Miami or Fort Lauderdale. But it would be a shame if you missed the pure beauty of the Bahamas! Take a Bahamas Day Tour from Fort Lauderdale and spend the day relaxing on some of the Bahamas best beaches like Pig Beach or some of the beaches you’ll read about in this article! If you’re in Nassau already, let us show you the newest way to fulfill all of your Bahamian desires with this complete archipelago tour. Unlike other Bahamas tours, our tour takes you into the air and shows you a bird’s eye view of one of the most beautiful regions in the Caribbean Sea. It’s a luxury ride that allows you to experience it all over the course of a day. It’s a once in a lifetime opportunity, so you may as well make the most of it. Nassau is the capital city of the country and lies on New Providence island. It is here where most tourism takes place. With its hilly landscape and stunning beaches, it is no wonder the city makes for one of the best horseback riding Bahamas destinations. Get the best Nassau horseback riding experience at sunset. Its romantic appeal attracts a lot of couples on vacation. Horses are kid-friendly as well, so take the whole family! Horseback riding Nassau Bahamas is something anyone can do, no matter if you’ve ridden a horse or not. There are beginner-level guides who will keep you safe and teach you as you go. Nassau’s location with its proximity to Paradise Island also makes for a great Bahamas base. If you are staying in Nassau on your Bahamas vacation, you may be interested in booking the most inclusive Bahamas holiday tour available. We offer an air tour to get pristine views of the Bahamas islands that many will never see. It is a full day tour, starting from early in the morning and returning in the early evening. If you’d like more information, you can check out our tour information page and book your favorite vacation activity today! Day trip Bahamas horseback riding in Nassau. One of the longest established stables in the Bahamas is located in Freeport on Grand Bahama island. It is also known as having some of the best horse trails in the country. Rides usually last anywhere from 90 minutes to two hours, with a maximum of six guests to a group. Professional guides will take you throughout the island, telling you about some of the history and culture, and end at Freeport Beach where you’re welcome to enjoy the view. The management at most stables suggests riders wear shorts and shoes that can get wet, as excursions are all on the beach and include wading through knee-high coastal waters. I don’t think anyone will complain about that on their horseback riding Freeport Bahamas adventure! Bahamas horseback riding day tour on the beach. Half Moon Cay, also known as Little San Salvador Island, is a private island owned by the cruising company, Carnival, and known for its long crescent-shaped half-moon beach (hence the nickname). On Half Moon Cay, you’ll likely ride two different horses — one for the land section of the excursion and one for the water part. You literally get to wade through turquoise waters at sunset on Half Moon Cay. It doesn’t get much better than that. You’ll have plenty of time to enjoy the beaches, tan in the sun, and even enjoy authentic Bahamian barbecue. Bird lovers will love this ride as one of the best islands to see exotic birds in the Bahamas. Half Moon Cay horseback riding Bahamas is an excellent way to spend an afternoon in the Exuma Cays. Connected to the city of Nassau via two harbor bridges, Paradise Island sits just off New Providence and is frequented by gamblers for its enormous Atlantis Resort and Casino. However, it is not just seen by gamblers. It’s a beautiful island that you’ve probably seen in photos before! There are white sand beaches and mixed-shades of blue and turquoise waters. The beaches make it a perfect destination for Paradise Island horseback riding. Along with Paradise Beach, Cabbage Beach is another popular, relaxed destination among tourists on the island. Both of these beaches can be accessed on horseback and you’ll be glad you did. 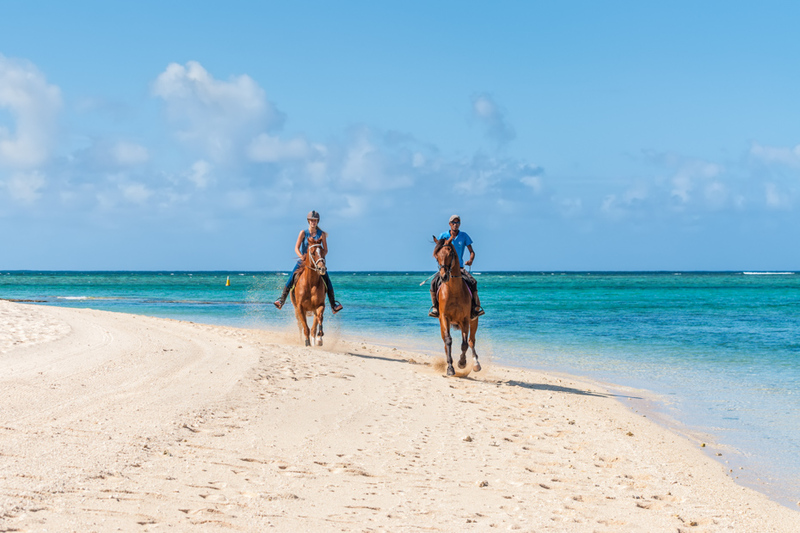 Nassau horseback riding also extends onto Paradise Island. Pink Sands Beach on Harbour Island is Instagram famous. You may have seen the beach before — bright pastel-colored pink sand along the turquoise waters. It’s a dream, really. And the island itself isn’t bad for Instagram either. The homes on Harbour Island are pastel-colored as well, with delicate white-picket fences bordering each of their gardens. It really is a picture-perfect island, so if you’re looking for your next Instagram inspiration, look no further! Fortunately, Pink Sands Beach horse riding exists on Harbour Island — talk about an Instagram post! But where did the pink sand come from? Most scientists agree that the pink hue comes from the thousands of broken coral pieces, shells, and calcium carbonate materials left behind by foraminifera (tiny marine creatures with red and pink shells) that live in the coral reefs that surround the beach. You learn something new every day! As mentioned earlier, Grand Bahama Beach is located in the city of Freeport on Grand Bahama island. Grand Bahama Beach horseback riding is often regarded as the ultimate Freeport horseback riding Bahamas adventure. Take your horse on a guided trip through the hilly countryside and onto the soft-sand beaches. Then, you can literally ride right into the Caribbean Sea. What a dream, right? Wading through the Caribbean Sea on a Bahamas Day Trip. Horseback Riding Bahamas – Just One of Many Things to Do During a Bahamas Day Tour! Horseback riding Bahamas is one of the truly beautiful things to do in Bahamas. If you get the chance, whether you’re coming from Florida on one of our luxury Bahamas Air Tours or you’re spending a vacation in the Bahamas, you should make it a priority to do horseback riding Bahamas! Bahamas Air Tours offers the only chance to see a birds-eye view of one of the most stunning regions in the entire world. Every seat on our private flight is a window seat! It’s a fact that astronauts returning from space have always remarked that the “Bahamas is the most beautiful place on Earth viewed from space“. Come and see why on our Bahamas Island Hopping Air Tours. We offer an excellent day trip from Nassau that will give you a wonderful experience with the Swimming Pigs Bahamas and save you hours that you would otherwise be stuck on a crowded ferry tour. See for yourself, consult with us today about the best tour that would fit your itinerary!